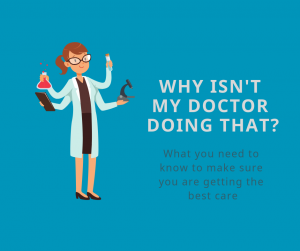 Recently, while delivering a comprehensive plan for a client, they exclaimed with exasperation “ Why isn’t my doctor doing this”? As a result of this encounter, I will attempt to answer this question and hopefully level set the expectations of future patients. The simple answer is, they don’t have the time. It’s not what we want to hear especially when we are looking to them to be the experts. Is this valid? Do they really not have time to do their job? In a recent study published in the Annals of Internal Medicine: “Allocation of Physician Time in Ambulatory Practice: A time motion study in 4 specialties. “ 57 physicians representing four specialties were observed for 430 hours. All of the observable time was in the office; hospital time and time in the operating room was excluded. The results of this study validate the fact that your doctor spends just 25% of their time actually calling on her/his skills as a physician due to the 49% of time they spend taking care of the administrative tasks of medicine. If you have been to your doctor recently you probably noticed that s/he spent as much time communicating and/or examining you as s/he spent typing or dictating into a computer as they try to stay on top of the administrative demands government or insurance industry regulations have placed on them. Despite the disproportionate amount of clinical to administrative time in the office, Doctors were found to spend an average 1.5 additional hours completing data entry at home. So what does that mean for you, the patient and healthcare consumer? Now, more than ever you may want to seek the second opinion of a “specialist” if you have a “less common” cancer. The general medical oncologist has a basic knowledge of a variety of the most common cancers; however, for many physicians, time once allocated to reading up on novel therapies or researching clinical trial options for patients has been replaced by administrative tasks. You, the patient and consumer must be more proactive to ensure you are prepared for each appointment in order to maximize the few minutes of face time you have with your clinician. My client had been diagnosed with a “rare” form of a common cancer. She did not feel like her oncologist was hearing her and so she called me. After reviewing her case I helped her access the expertise she needed. If she had not been proactive she may not have gained access to the newest treatment protocols for her type of cancer. If you have questions about your current situation please contact me via this site or by phone, 703-403-7600. I am happy to speak with you.